for every rule . . . I'm going to finish my Mordheim gang. I promise. After a frustrating session Sunday with one of the 3 remaining figs in the gang, I really needed a break. 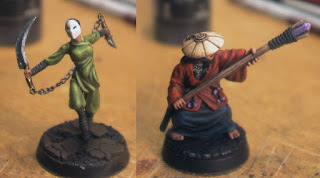 Its not that I'm tired of the bandits, I'm actually really enjoying them, its just the painting style I'm doing (and the delicacy of the figure I'm working on in particular) takes a certain level of concentration that was exhausting me. I had the urge to sit down and paint, but just not that way. So. . . I took a quick diversion into something that I've been thinking about and planning in my head, and knew that I could get some good fast progress done. It felt great! 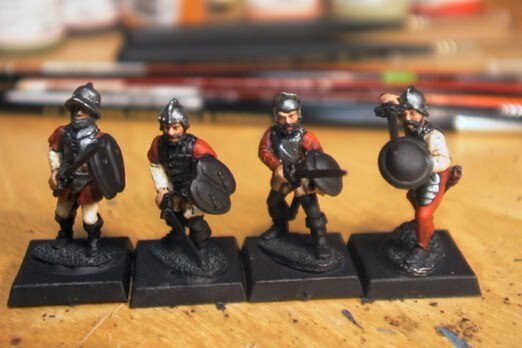 These rodoleros are from The Assault Group's rennaissance range, and I'm painting them as a Portuguese military order for my Empire army . . . because thats what I do. I'm not going to do the whole unit or anything, that's farther down the list. 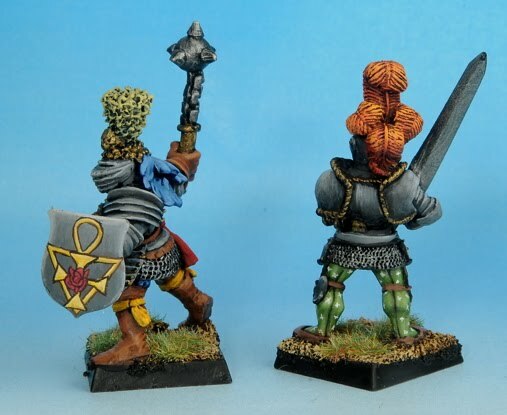 Pete from TAG was looking for some paint jobs to expand their online galleries which I was happy to assist with. I picked these as my free demo pack, and so I do want to get the images back to him in a somewhat timely manner- sooner than the unit they'll be a part of comes up on my 'to paint' list at least. 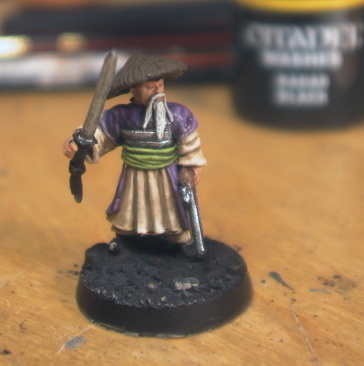 Anyway, that's how I'm justifying my Painting ADD attack that happened tonight at least. It did feel good to get the lions share of 4 figures done in two easy sittings interrupted only by eating dinner and watcing MadMen with my darlin'. Take THAT, wuxia bandits! the light at the end . . . I made a little progress last weekend while my sister was out of town for a couple days, and again tonight now that she's ended her visit and returned to the plains for good. These barricades I had done all the way up to the ground work and flock, so they required only a few minutes of attention tonight to get them on their way. 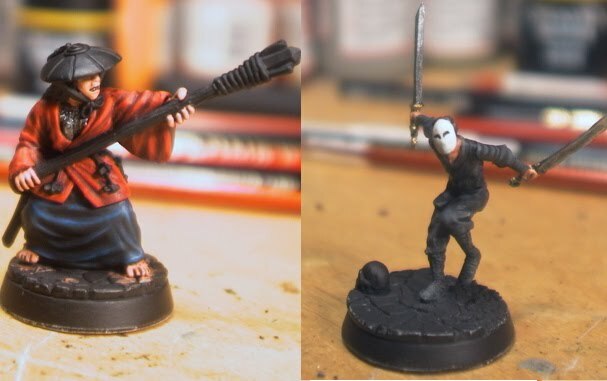 Nothing like an impending game to get me to push the last 10% of the way on the little projects like these that I have sitting around for when I only have a few minutes to spare and no time to get out the brushes for a proper painting session. 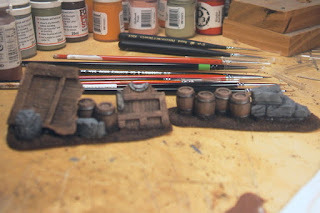 I think I have 3 or 4 more of these built and primed, though I think this is all the wooden bits I have; the remainder are all stones and columns. The barrels, ruins, and wood jobbies are all resin bits from Fenris. Its nice to be back at this painting business, and especially since I'm doing stuff that excites me. I really needed to buy some lower-faluting brushes to get excited again. It was rapidly becoming clear that I don't know how to use the fancy ones very well for any techniques but linear highlights and deep lined shading really. Rather than try and learn new tricks this old dog returned to what he knows best, and my satisfaction has improved for it. 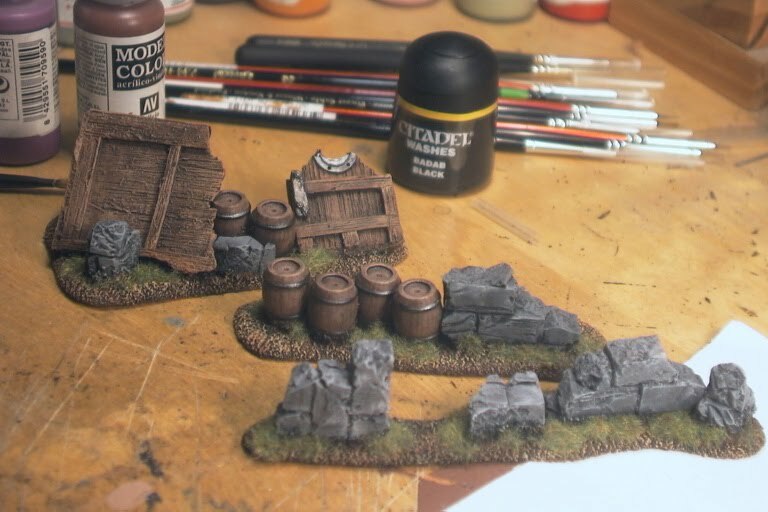 Anyway... here are some more fruits of my down-graded brush quality. I'm totally digging the characters for this warband. Ok, I can see why everyone is raving about Badab Black. I won't say its super amazing, or going to revolutionize the world, but it is a damn nice black ink. It behaves well, and is subtle enough out of the bottle that you can play with it and get a nice spectrum of effects with it. 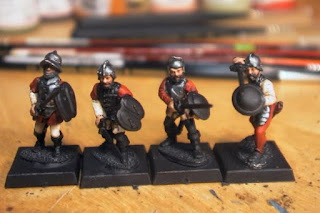 All the figures I have left for this gang are the characters- mostly from the Kislev list, and then a few hired swords just to fill out the ranks and make use of other cool figures I found. 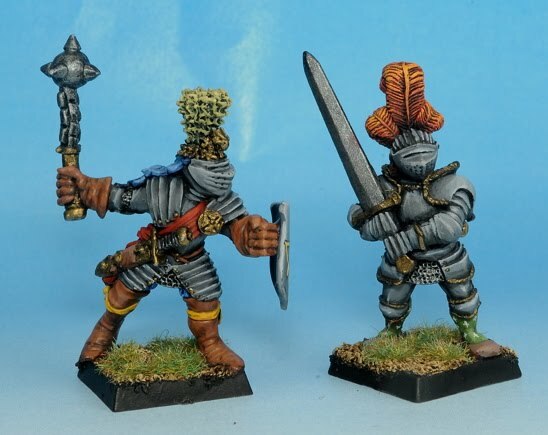 The first to get anything beyond their flesh done are two hired swords: a wizard and what will probably be a pit-fighter if he's ever hired. two knights in a row. I'm not sure why my camera kept having trouble focusing on this, but this is the best I could get for some reason tonight. Maybe its tired-user-error. Anyway, I made some progress on the first of a pile of barricade pieces tonight.